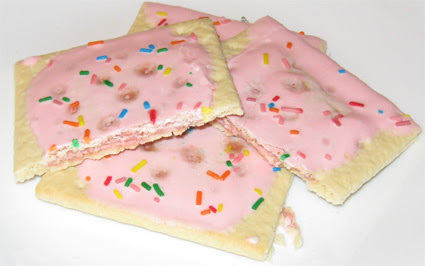 You might recognize these as the "NEW" Strawberry Milkshake Poptarts. I like to throw a box of poptarts into the cabinet now and then so I bought these back during an April shopping trip when I also bought the DQ Oreos. I thought it would be cool to do back to back, ice cream themed product posts. Unfortunately when I tried then back in April, the filling was this disgusting, liquidy stuff that I REALLY did not enjoy. I don't do slimy. I was so unamused that I left them in the cabinet and never posted anything. Well, when I joked that these were so bad that they were "rotting" in the cabinet, I meant it. Now even though these are supposedly good 'til March of 2011, you can see they have gone bad. Whatever was making the filling liquidy has now been sucked up into the sugar frosting - it's those dark red spots that didn't use to be there. The filling is now dry like a regular poptart. I didn't like them before and I'm sure not about to try them again now. HAHAHA I meant well, I swear!